As a result of its natural shine Nebula does only need a moisturizing base applied when working on drier skin. Spray on Nebula Complexion за еърбръш 14 мл in ‘Oak’ & ‘Beech’ on to the face for a flawless & long-lasting foundation. Фон дьо тен HD Micro Cache is tapped under the eyes to correct dark circles. A shaped face can be achieved by applying Nebula Complexion за еърбръш 14 мл in ‘Mahogany’ & ‘Beech’ for shade & highlight. Nebula Iridescent за еърбръш 14 мл (luxurious red) is used on cheekbones for a shiny, ‘cheek-popping’ result. 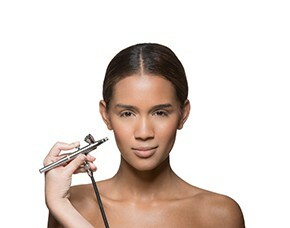 Giving the face a natural contour supports the airbrush make-up itself creating a weightless complexion. Nebula Vivid за еърбръш 14 мл (true black) is used all over the eyelids, then Nebula Chromatic за еърбръш 14 мл (butterfly) is sprayed within the arcade area (over the black) to contour the eyes. Nebula does not only create a natural look but can be build up to achieve a more dramatic appearance. To finish the strong, dramatic eye make-up spray on Nebula Iridescent за еърбръш 14 мл (mysterious green) in the inner eye corner. To perfect glamorous smokey eyes HD крем очна линия (ebony) is applied and ‘TV 5‘ Eyelashes are added to the lash line. A dramatic outstanding eye make-up requires matching eyebrows. A stencil is used with Nebula Eyebrows за еърбръш 14 мл (cocoa) to achieve a perfect powerful brow. To complete a natural but thrilling look Червило Sheer (iris) is added to the lips. Nebula does allow a natural appearance. By building up the product a make-up artist can approach different directions such as fashion, avant-garde or even phantasy.